This sign is located near Rayners Corner beside Glenora Road on route to Bushy Park. Years ago a friend and I drove up along the Lyell Highway, and then took a track down to the river somewhere between New Norfolk and Gretna. We walked across a gravel bed to a rocky scrubby clump edging the water. For a couple of hours we sat on the river side with our feet swinging above the glossy glassy black racing water of the Derwent River, lulled by the sun. I remember the clear reflections of the dense vegetation on the other side of the river. It was a joy to see fish rising to grab an insect that had been flitting near the water surface. Clouds began to pile up in the distance and around that time I looked down and realised the water was nearly touching my feet. The river’s water level was rising. We clambered back to the other side of this outcrop and discovered, to our horror, a swirling and dramatic pour of water separated us from the river bank. In recent blog postings I have mentioned the speed with which the Derwent River travels towards the sea. That day was my first experience of its dangerous fast moving flows. The river was rising as we watched. We were stranded on an island and we didn’t know how much water had been released upstream. This meant we didn’t know whether the island would become submerged. Within seconds we knew we had to try our luck and get back to land. Quickly we cast our eyes around for a couple of suitable branches that could act as walking sticks, as balancing poles, so we could cross the raging torrent. Each of us started the crossing with a balancing stick. I remember stepping into that cold water and finding how uneven the ground was. It was not a simple gravel bed rather I was trying to walk on irregular sized rocks that rolled when I was pushed onto them by the force of the water. I remember that it was important to tread slowly and to lean my body at an angle towards upstream to counteract the pressure to send me downstream. When I started the crossing the water level was at the top of my thighs. The distance wasn’t far but the water reached around my waist and splashed higher as I approached the safety of the river bank. Once out of the water, we felt exhilarated. But we both knew the danger we had been in. And similar signs to the one in the photograph above were not around. Situations like this remind me of the powerful importance of local knowledge. 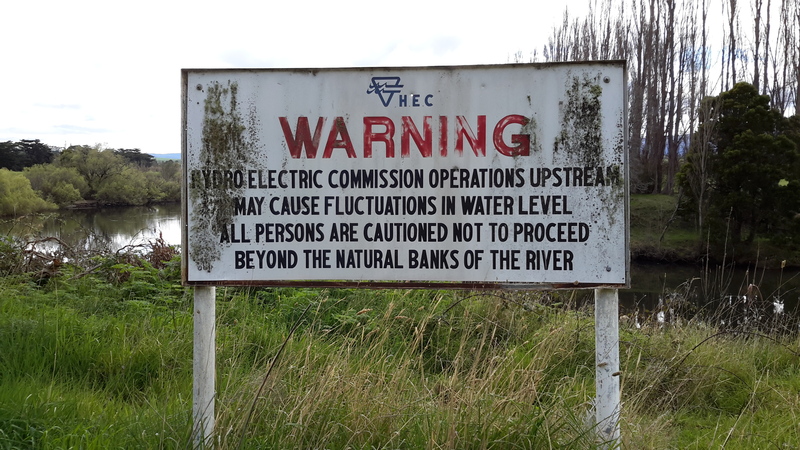 This entry was posted in Derwent River, Tasmania, Walking and tagged Bushy Park, danger, Derwent River, fish, Glenora Road, Gretna, Hydro Electric Commission, Lyell Highway, New Norfolk, Rayners Corner, reflections, River, unpredictable, water levels on October 7, 2015 by Tasmanian traveller.